Tennis facilities and providers are encouraged to sign up to host a Tennis Play Event this September! The first 2,000 registered events across the country will receive a $50 Amazon.com* Gift Card** -- in addition to greater visibility in your town for your facility's programming efforts. 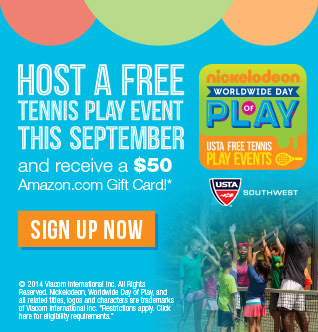 Tennis providers can use the power of Nickelodeon and celebrate the network's annual Worldwide Day of Play to help grow local tennis programs. Events can be for kids and families of all ages and skill levels, or, just to host a Play Day to introduce kids to the thrill of competition. EXPOSURE -- Provider events are listed on www.YouthTennis.com so parents can find them. Promote events with customized flyers and other marketing and promotion assistance, and get helpful tips from other tennis providers (contact USTA Southwest Marketing Director Jeff Sikes at sikes@southwest.usta.com for more assistance with yours). NEW REGISTRATION SYSTEM -- Enhancements to www.YouthTennis.com now allow providers to track attendance as parents sign-up their kids before an event. NEW PARTICIPANTS -- Events for kids or entire families boost program visibility and participation. * Amazon.com is not a sponsor of this promotion. Except as required by law, Amazon.com Gift Cards ("GCs") cannot be transferred for value or redeemed for cash. GCs may be used only for purchases of eligible goods at Amazon.com or certain of its affiliated websites. For complete terms and conditions, seewww.amazon.com/gc-legal. GCs are issued by ACI Gift Cards, Inc., a Washington corporation. All Amazon ®, ™ & © are IP of Amazon.com, Inc. or its affiliates. No expiration date or service fees. **No purchase necessary. Registration on www.YouthTennis.com starts at 12:01 on July 15, 2014 and ends at 12:01 on September 30, 2014. United States Tennis Association Incorporated reserves the right to substitute in its soled discretion, limited quantities available to the first 2,000 registered events. USTA is not responsible for delivery or redemption. © 2014 Viacom International Inc. All Rights Reserved. Nickelodeon, Worldwide Day of Play, and all related titles, logos and characters are trademarks of Viacom International Inc. © 2014 United States Tennis Association Incorporated. All rights reserved.